Launching in/SIGHT – the LA Phil's groundbreaking series of concerts with video – this program embodies the vision of the New World as a place of unlimited artistic freedom. Amériques was the first musical piece that Varèse composed upon coming to New York and this project is fittingly the first site-specific audio-visual performance that I produce in the U.S. I approached this collaboration from the standpoint of a non-linear and ephemeral interaction between Salonen, Varèse, and me, and hope that I will be able to transform Varèse’s timeless musical fiction into an immersive visual medium through which a new kind of storytelling will occur. Rather than approaching this medium as a means of escape into some disembodied techno-utopian fantasy, this project sees itself as a means of return. It aims to facilitate a temporary release from our habitual perceptions and culturally biased assumptions about being in the world, and to enable us, however momentarily, to perceive our own stories and the stories around us freshly. Finally, I would like to sincerely thank everyone who made this project possible. This project would never have been possible without the tremendous and generous support of Los Angeles Philharmonic, President and CEO Deborah Borda; Vice President of Artistic Planning Chad Smith; Artistic Administrator Meghan Martineau and Concert Operations Manager Taylor Saleeby. I would also like to thank for their open-handed support the University California, Los Angeles, Department of Media Arts’ faculty members, Microsoft Research, and Lili Cheng, Finally and specially I would like to thank Frank Gehry for his dreamful canvas and Esa-Pekka Salonen for his open-minded collaboration with me to discover “New Worlds”. Czech Philharmonic and maestro Manfred Honeck performing Richard Strauss's Tod und Verklärung in Rudolfinum, Prague. 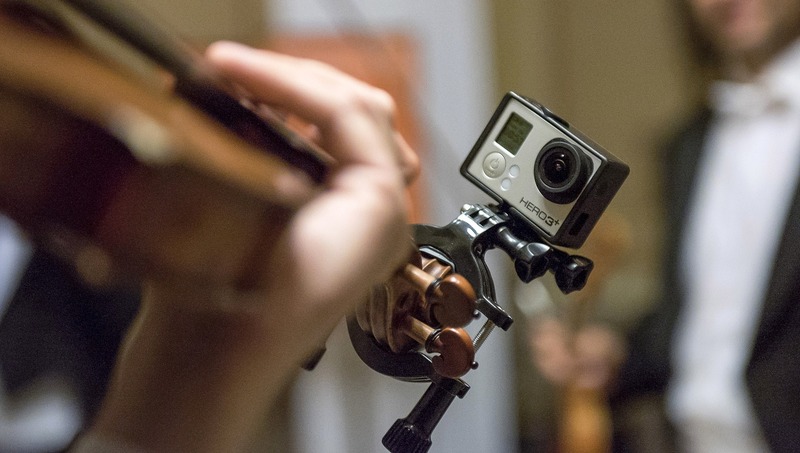 The footage was recorded on 24 GoPro cameras placed among the musicians on stage of the Dvořák Hall and mounted on instruments, musicians, and the conductor himself. Symfonická báseň Smrt a vykoupení Richarda Strausse v podání České filharmonie a dirigenta Manfreda Honecka. K pořízení unikátního záznamu bylo použito 24 kamer GoPro, rozmístěných na pódiu Dvořákovy síně pražského Rudolfina, ale také přímo na nástrojích, hudebnících i samotném dirigentovi.